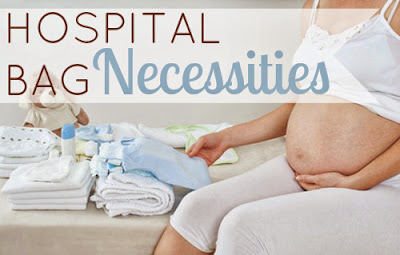 A New Leaf: Purposeful Parenting: hospital bag must-haves! I have to start this by saying I desired a home birth, but when we first knew we were pregnant, Jason did not feel comfortable. We committed to a hospital birth, but if God should bless us with another pregnancy, we will, God willing, have a home birth. Home births, in healthy, "normal" situations are best for mama and baby. That being said, there absolutely are times when a hospital birth is necessary, and most babies are born in a hospital today whether because it is necessary or because the parents have chosen to birth in a hospital. And if you're going to be at the hospital, let's just face facts: it is nothing at all like being home. I read countless articles on what to pack in a hospital bag and I found I still didn't have everything I wanted. Our hospital was incredibly close to home, so every day, Jason came home to feed Preston and to gather what else I desired. Also, that being said, we had no clue we would be at the hospital for so long. We were there, all told, for about 84 hours. Toiletries - I'm talking your favorite body wash, shampoo, hair brush, toothbrush, toothpaste, lotion. Whatever your normal morning routine encompasses, bring it. When you finally take a shower, you'll be so grateful to have a sense of normalcy, not just in the routine of getting around for the day, but also for the comforting smells of your normal products. Comfy clothes - Think sweatpants, loose underwear (I highly recommend maternity underwear), maternity t-shirts and baggy hoodies. Don't forget slippers! If you're a socks kind of gal, bring those. I am not, so I just made sure I had my slippers. Books, magazines, digital devices, etc. - my iPod was a saving grace for me, as was my computer for keeping in touch and feeling normal. Everything I had read said not to bring reading material because "you won't have time." Well, I did have time, and Jason was gracious enough to bring me books and magazines from home. I found I didn't have the attention span for books in the hospital, but magazines were perfect. Books for your baby - I may not have had the attention span for adult books, but I had never thought to bring books for Bug until after she was born. Jason brought books we had from home, and we read to her each day. You certainly don't need to use children's books. You can read to your baby from the Bible or whatever book you're currently reading. Just hearing your voice is important. Pillows and bedding from home - Whenever we travel to a hotel, we always pack up all our own bedding and bring it with us. Sheets in a hotel typically do not have a high thread count (we stay in budget hotels when we travel). Sadly, we did not take all our own bedding to the hospital, but I did have my own pillows and this made a huge difference in my comfort level. Camera and cell phone - You'll want to take loads of pics of your newborn and your cell phone is useful for calling all your relatives to announce the baby's birth. A variety of clothes for your newborn in a variety of sizes - Depending on the season, it might be hard to anticipate just what kind of clothes they'll need for their trip home. It was winter when Bug was born, so we brought just two sleepers - one in a newborn size and one in 0 - 3 months. Bug fit in the newborn size (it was actually a little big on her, even though she was 8 lbs. at birth! ), so she wore that sleeper home. That list shows that not a lot is needed, and trust me, it's not. I felt I had actually packed too much when all was said and done. Keep your packing simple and know that if need be, your husband can travel back home, even if the hospital is far from home. In this time, you just make things work and trust me, your husband will not mind getting you what you need. You just birthed his baby! He will be happy to help you recover from birth and spend time with the baby while he runs around for you. At least, my husband did not mind and I am fairly confident your husband is just as wonderful as mine! Diapers, blankets, formula, wipes, etc. - While your baby is in the hospital, the hospital will provide all of these things for you (and give you extras to take home!). The only thing we absolutely needed for Bug was clothes to come home in. Snacks and beverages for after birth - During labor, if the hospital allows (or if you override their decision), snacks and beverages may be useful. After birth, snacks, meals and beverages are provided. Keep in mind that meals likely won't be provided for your husband, however, the meals provided to you may be so large you can share. We shared most of my meals, although I have no clue if this is "allowed." We just did it and didn't care what anyone thought. Jason also usually grabbed something to eat at home when he fed Preston. Food was definitely not an issue. Shoes - I personally do not advocate for shoes in the hospital. First of all, your feet will likely become very swollen. Swollen to the point that shoes will not fit. Stick with socks and/or slippers and leave the shoes you wore to the hospital in a closet there for the time being. Don't pack extra shoes - you'll have no use for them. Make-up - This is definitely a personal choice. Even if you normally wear a full face of make-up, however, I really think you won't want to wear make-up. Honestly, you just gave birth and life is a little crazy right now. Go bare and revel in it. It's all the better for cuddling with your precious bundle, too. I'd love to hear what items were essential for you and which ones were not! I want to be sure I'm fully prepared next time in the event of a hospital birth... if that's even possible to be fully prepared! One thing I REALLY wanted that I had not thought to pack was a razor and shave gel. After 3 days, I couldn't really stand my arm pits. I have really fast growing body hair, though, so maybe that wouldn't apply to everyone. I packed too much clothing for myself and would only recommend 1 change of clothes besides what you wear in. Even if you have to stay for a few days, you'll be in a hospital gown most of the time. Finally, we were very glad that we brought snacks, as our experience with the hospital's food was very different from yours. Thanks for sharing! I had no desire to shave at all, and I don't usually have the desire outside of labor/delivery either, so that's a good point (since I'm pretty sure most people like to shave). I ditched the hospital gown ASAP without consulting anyone. For me, it was so uncomfortable! I was out of it by 9 PM, about 4 hours post-op. Definitely a personal thing, though.